After a long day away from home, the last thing you want to do is prepare and cook a meal. Luckily, you can be prepared for this situation with a bit of advance planning. For those situations when you know you have a busy few days or week ahead, plan your meals by prepping or even cooking them in advance. That way, when you get home the only thing you have to do is throw all your prepped ingredients together and watch it cook, or take it out of the refrigerator / freezer and heat it back up. If you are caught in an unplanned situation, there are plenty of quick easy go-to meal options, as well. 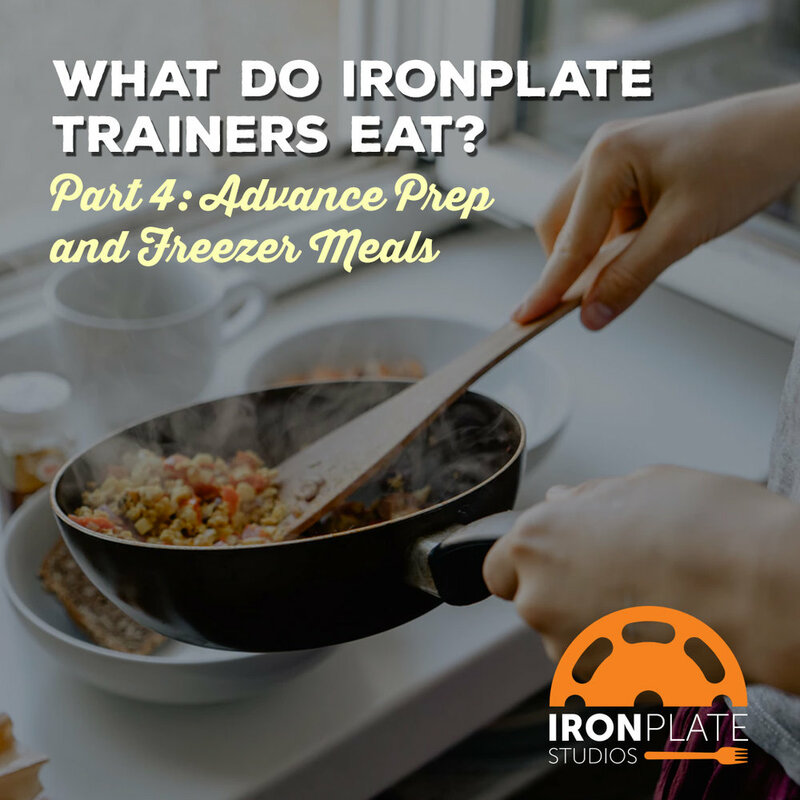 Our IronPlate Studios trainers have some suggestions for you! My go to quick meal is frozen shrimp. It only takes a few minutes to thaw, so you don’t have to worry about remembering to take it out before you leave in the morning. Once it’s thawed, sauté in pan with olive oil spray until opaque. Spiralize zucchini (or buy pre-spiraled!) and cook in the same pan with olive oil spray. Add seasoning of choice and squeeze of lemon. Enjoy! I love making a big batch of soup or chili on a Sunday especially in the fall and winter. I’ll take the left overs and put them in separate containers in the freezer for an easy meal I can heat up on the stove or microwave on an extra busy day. If I have nothing in the freezer, my go to meal is usually breakfast for dinner. In a large saucepan or Dutch oven, brown beef and drain. Add water, tomatoes and first 7 ingredients. Bring to a boil. Reduce heat, cover and simmer for 45 minutes. Add the macaroni. Cover and simmer for 15-20 minutes or until macaroni, peas, lentils and barley are tender. Yields 16 servings. *Fun Fact: This also makes a great gift! Layer all the dry ingredients (first 8) in a mason jar and attach the recipe. All the recipient will have to do is add beef, water and diced tomatoes. (Wrap macaroni in a separate baggy and layer on top since it gets added in later). For a quick meal if nothing is prepared, I enjoy breakfast for dinner! Scramble 3-4eggs with a handful of spinach. Serve with ½ an avocado, hot sauce and fresh chives. I like to marinate chicken in a ziploc and throw it in the freezer. If I know I have a busy day coming up, I can pull the already flavored chicken out to defrost before I leave for the day. When I get home, I pour the whole thing in a pan, and throw it in the oven at 350* for about 30 minutes. I also usually keep microwavable steamed green beans in the fridge (2minutes in the microwave) to eat with the chicken. Cook quinoa as directed on package. Brown beef and drain and discard fat. Sauté mushrooms and broccoli. Mix together. Eat some right away and freeze the rest or freeze it all in individual containers for easy meals to heat up later!